This wooden dowel features a round tenon on one end which will eventually be glued into the heel of the neck. The dowel stick brings the rim and the neck together. The dowel can take different forms. I use a wooden dowel stick. Many banjos feature a steel rod that serves as a dowel. Some banjos even have two steel rods that may be adjusted to change the neck angle. In any case the dowel stick accomplishes its job by mounting to the tail of the banjo rim and by attaching to the neck. In the case of the wooden dowel, the dowel is joined to the neck using a tenon and the neck/dowel is held securely to the rim with a brace. The other end of the dowel is held in place by a screw. In the case of a steel dowel, the dowel screws into the heel of the neck and screws or bolts into the rim at its opposite end. At right: the tenon cutter used to cut the round part of the dowel stick. 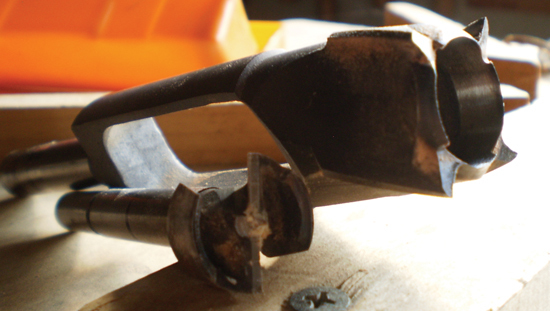 At left: the forstner bit used to cut the dowel stick hole in the heel of the neck. The place where the neck and rim meet is really the heart of the banjo. There is a lot that happens in this area. This is where the dowel stick inserts and is glued into the neck dowel stick hole to join it to the neck. The dowel then inserts into the rim dowel stick hole. The dowel is not glued to the rim. The coordinated location of the dowel stick holes is critical. It is wise to have a target depth in mind for the rim from the very start. This means choosing a tone ring style from the start or at least making a plan that allows for flexibility. I like for the edge of my fingerboards to come out just even with the top of the banjo head. To make this happen it is essential to plan out the placement of the neck dowel stick hole and the rim dowel stick hole. The total depth of the rim can be found by measuring its depth with the tone-ring in place. 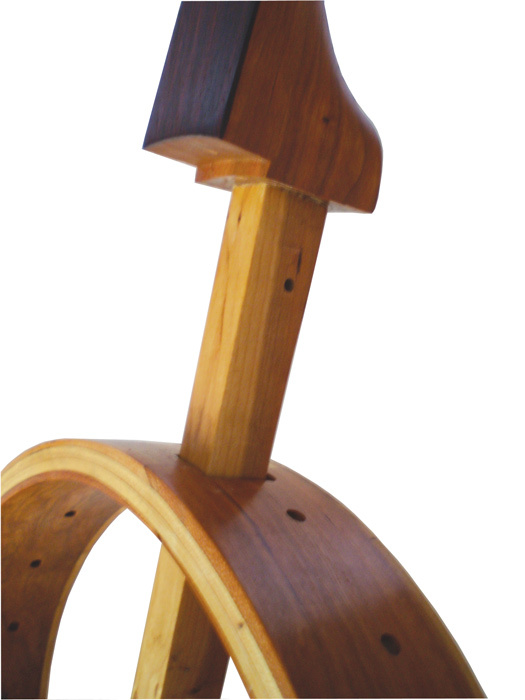 As can be seen in the picture below, the dowel joins the neck at a depth which allows for the tension hoop rabbet. The tension hoop must have this space in order to be tightened properly. Most tension hoops need at least a 5/8″ deep tension hoop rabbet. A bit deeper is not uncommon. A target depth of 1 1/2″ from the face of the fingerboard for the center of the neck dowel stick hole is okay but should be adjusted for each banjo. The dowel stick brings the banjo neck and the banjo rim together. The ledge that is cut into the end of the neck is the tension hoop rabbet. Notice the small hole in the side of the dowel stick. That hole will be used for the neck brace pin.